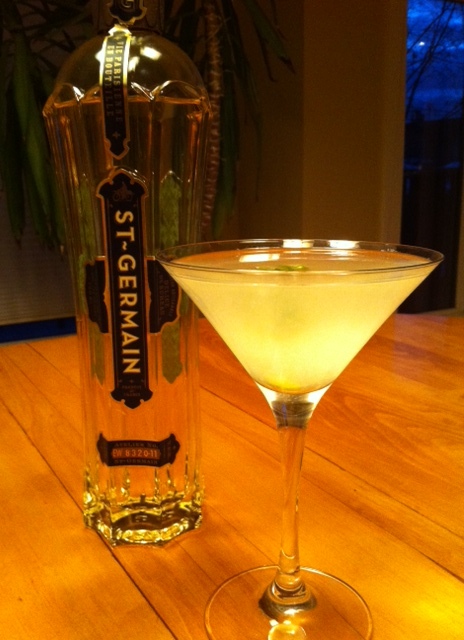 I have been searching for St-Germain for several months. This trendy French liqueur is made from the blossoms of elderflowers and has become an “it” mixer to add to drinks such as gin and tonics or champagne cocktails. Sadly, liquor stores in Calgary either do not carry it or are sold out of it. So when my husband came across a large bottle at a liquor warehouse in Scottsdale, Ariz. (not unlike Costco, only stocked with booze — the warehouse, not the city) he snapped it up. Even the bottle looks French. Tres chic! 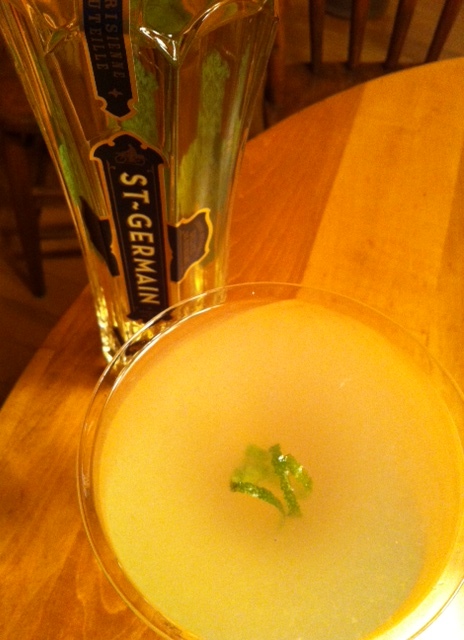 I went online to search for St-Germain cocktail recipes and came across the French Gimlet. A traditional gimlet, if you’ll recall from the 70s, called for either vodka or gin plus Rose’s lime, a cordial that is super-sweet and also a frightening green hue from the Blue 1, a food colorant. I am happy to report the French Gimlet calls for fresh squeezed lime juice and relies on the St-Germain as the sweetening agent. On its own St-Germain tastes rather like Lillet, but with both fruit and floral notes and, to summon my inner French mademoiselle, a “je ne sais quoi” that’s almost honey-like. Curiously, when shaken with vodka and lime juice the end result is not unlike a Dawa cocktail. I liked it, but mostly I am just excited to add a bottle of St-Germain to the liquor cabinet! Vodka meets lime and St-Germain. Pour all ingredients into an ice-filled shaker and shake well. Strain into a coup or martini glass. Garnish with a lime twist. This entry was posted in Cocktails and tagged elderflower liqueur cocktails, French gimlet, St-Germain, St-Germain recipes. Bookmark the permalink.